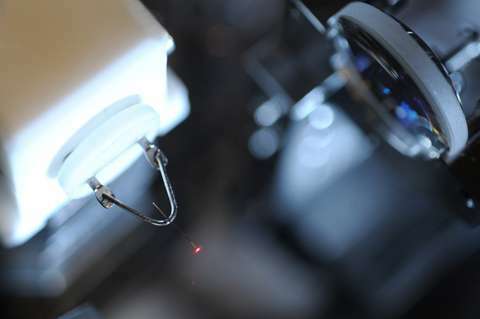 (PhysOrg.com) -- Scientists at the Max Planck Institute of Quantum Optics control for the first time the emission of electrons from metal tips with femtosecond lasers alone. The steering of electrons with the electric field of well-controlled femtosecond laser pulses makes it possible to resolve atomic processes on an attosecond time scale. The independent Research Group Ultrafast Quantum Optics of Dr. Peter Hommelhoff has now applied this method to solid state surfaces, i.e., to extremely sharp metal tips (Nature, 07 July 2011) This way the scientists were able to show that comparable small laser intensities are sufficient to steer the emission of electrons from the metal tip with the phase of the optical cycle. The modulation observed in the resulting energy spectrum can be explained with the occurrence of a phase dependent coherent interference of electron wave packets, in agreement with numerical calculations. The new technique is of interest not only for fundamental research. The experimental device represents a simple, compact and very sensitive system for the precise measurement of the phase of laser pulses and could lead to the development of ultrafast optical transistors. In the experiment a tungsten tip (fig.1) is irradiated with light pulses of few femtoseconds duration (one femtosecond corresponds to a millionth of a billionth of a second, fig. 2). If the intensity of the laser pulse is high enough the electrons can absorb the amount of energy that is necessary to be released from the metal tip. Then they can be registered by a detector in front of the tip. Typical time structure of the electric field of femtosecond laser pulses. The maximum of the oscillation of the carrier wave (blue) depends on the phase relative to the maximum of “the envelope” (green). In the left pulse the phase difference amounts to 180 degree whereas in the right pulse it is 0 degree. As the tip is extremely sharp, having a curvature radius of about 10 nanometres only, the intensity of the laser light gets greatly amplified. With this, relatively weak laser pulses are sufficient to set free electrons from the metal surface. Because of their short duration the laser pulses contain a few cycles only. Therefore the electric field acting on a particular electron is strongly dependent on the phase shift of the carrier wave relative to the envelope of the pulse (see fig. 2). In the experiment the number and the kinetic energy of the emitted electrons are measured for different phase shifts. As is demonstrated in fig. 3 the structure of the electron spectrum is strongly influenced by the phase shift. Here two spectra are displayed that have been taken with phase shifts differing by 180 degrees. First of all differences can be noticed concerning the number of electrons at high energies. The higher the electron energy, the more we approach the situation that we are able to switch the current on or off by simply changing the phase shift by 180 degrees, Michael Krüger explains, who is, with Markus Schenk, doctoral student at the experiment and one of the two main authors of the publication. Energy spectra of electrons for different phase shifts (180 degree and 0 degree). At a phase shift of 180 degree pronounced equidistant maxima are observed, whereas there is no interference structure for 0 degree. The insets explain the physical processes: In the left picture electrons with high energies are emitted at two time intervals (red ellipse) during the pulse which leads to the quantum mechanical interference pattern of the spectrum. Instead, in the right picture electron emission is possible only once per pulse. Therefore no interference can occur. In this case, however, the electrons gain on average more kinetic energy, and the number of electrons at higher energies is larger. The shallow slope of the curve between 5eV and 10eV (especially at 0 degree) indicates elastic re-scattering in the laser field. It is also determined by the chosen phase shift whether pronounced peaks in the spectra can be observed or not. These maxima are a consequence of the quantum mechanical wave nature of electrons (fig. 3): At a phase shift of 180 degrees electrons can be emitted during two time intervals of the light pulse. The interference of the two matter wave packets at the metal tip leads to the observed interference structure in the spectrum. If, on the other hand, the phase shift equals 0 degree, electrons can be emitted only once per pulse. Hence no interference can occur, and the maxima disappear. We therefore obtain information on the electron dynamics with attosecond precision, a region, that we cannot access using conventional electronics, says Markus Schenk. From the slope of the spectrum the scientists conclude that the laser field continues to influence the motion of the electrons even after emission from the metal tip. The almost constant count rate at medium high energies implies that the released electrons are driven back into the tip by the laser field and scatter elastically off the tip before being detected. As is demonstrated in the experiment this scattering process does not destroy the interference of the electron wave packets, that means, it takes place in a coherent way, Markus Schenk points out. The resulting spectra are surprisingly well reproduced with numerical calculations based on a simple model that describes the motion of the electrons in the electric field of the laser classically but takes their wavelike nature into account. For the first time the physicists have succeeded in the steering of electrons emitted from a solid state by the field of a femtosecond laser pulse. Even more, much less intensity was required compared to experiments with electrons in atomic or molecular gases. On the one hand, the new method is an important tool for gaining insight into the dynamics of electrons in solid state surfaces. For example, it is not known whether the scattering process takes place at the entire surface or at a single atom inside or on the surface. On the other hand, because of the low laser intensities required, there is a high potential for practical applications. 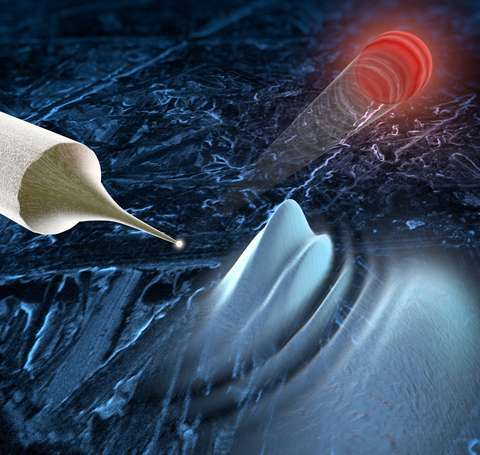 Combining a metal tip, a retardation grid, and an electron multiplier, compact devices for the measurement and stabilization of phases of laser pulses could be realized. Also the development of optical field effect transistors can be envisaged in which the electric current can be switched on and off by the light field with attosecond precision. Remarkably, Einstein was first to explain the photo electric effect and discovered stimulated emission which lead to lasers.